A spin around Lake Junaluska the other day (12/2) turned up another unusual winter visitor plus highlighted the foibles and frustrations sometimes associated with birding. I had finished a quick check of the new wetlands and was headed back to my truck when I noticed a stranger among the resident gaggle of domestic greylag geese. The stranger was white with black wingtips, so snow goose immediately came to mind. The size difference between the visitor and greylags was pronounced – making me think this visitor was a very small goose – therefore a Ross’s. 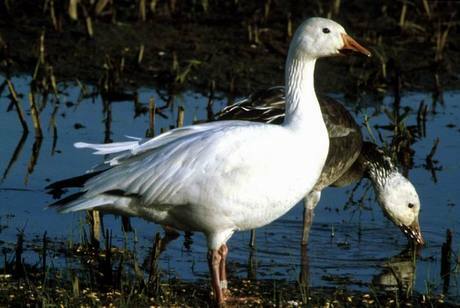 The Ross’s, Chen rossii, is a small (23 inches) goose that looks for the most part like a miniature version of the snow goose. It comes in two color phases, like the snow goose, one – white with black wingtips and the other, a dark or “blue” phase. The main difference between the two species other than size is head and bill shape and/or features. The Ross’s has a rounded head and short bill. The base of the bill – where it meets the bird’s face – is straight. And the Ross’s has little or no “grin patch.” The grin patch is the black serrated edge of the bill, prominent in snow geese that make the bird look like it’s grinning. This grin patch or serrated edge is highly developed in snow geese and enables them to saw off tough marsh grasses and sedges. The snow goose (both subspecies lesser, Anser caerulescens caerulescens and greater, Anser caerulescens atlantica), besides having a prominent grin patch, has a longer bill with a more wedge-shaped head. And the area where the beak meets the face is curved outward, away from the eye. It’s not a straight edge like in the Ross’s. I looked no further than the obvious white-morph snow goose form and size discrepancy between the visitor and its greylag hosts. Not wanting to spook the bird, I returned to my truck and called a friend to say I had just found a Ross’s goose at the lake. My friend was running errands and we made a date to meet back at the lake. When I got to the lake, my friend was there with his scope watching the goose and concurred that it was a Ross’s. The gaggle had taken to the water and once again it was easy to see the major size discrepancy. We chatted about what else was around the lake and watched as the birds swam a little closer. When I looked through my binoculars at the little fella, I noticed a grin patch. I mentioned it, but didn’t think much about it and I hit the road. But that grin patch kept bugging me. I came home, looked online at some photos and looked on page 79 of my copy of The Sibley Guide to Birds, where he illustrates the head pattern of a Ross’s, a Ross’s X lesser snow, a lesser snow and a greater snow. I realized I had shot from the hip and needed to get a better look at that bird. Friday morning I headed for the lake. I called my friend to say I had questions. Turned out, I wasn’t the only one. A couple of other experienced birders had a similar experience; one, immediately identifying the visitor as a Ross’s because of the comparative size difference; then, with longer looks, especially focusing on the head, questioning that ID. So Friday morning, the four of us with binoculars a field guide and photos were standing there within 100 feet of the bird. The one consensus was – the head was definitely snow goose. I and one other birder (I think) are mostly convinced that the bird is a lesser snow. One, I believe was, as of Friday, leaning towards greater snow and the other was still having trouble committing. What threw us all initially was the size discrepancy. But what we failed to take into account is the fact that greylags are giants of the goose world and those domestics are probably large greylags. As large as greylags are, I don’t think they would dwarf a greater snow goose (listed at 31 inches in my Sibley guide) the way they dwarf this bird. But I would think a Ross’s X lesser snow’s head would have intermediate characteristics like Sibley depicts – this goose’s head looked all snow to me – so I’m left with a small (probably female) lesser snow goose.